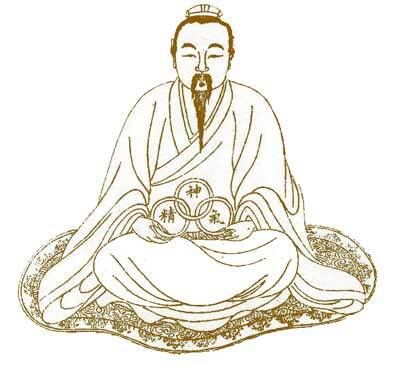 Jing (精), Shen (神), and Qi (氣) are shared by Daoism and Chinese culture and are referred to as the Three Treasures. Qi of the human body comes from the combination of three kinds of Qi, Primordial Qi inherited from parents, the fresh air inhaled by the Lung and the refined food Essence transformed by the Spleen. Primordial Qi is derived from the Congenital Essence of the parents and is the primary substance to produce an embryo. So it forms the basis of the human body and its life activities. Without Congenital Essence, there can be no human body. After birth, the congenital Essence is stored in the Kidney to promote development and to control the reproductive activity of the human body. The refined food Essence is generated by the food which is taken in after birth and is distributed all over the body to produce nutrients and Qi and Blood under the action of the Spleen and Stomach. Fresh air is inhaled by the Lung after birth and is the main source of Qi of the human body. From the process of formation of Qi, we can see that Qi of the human body is closely related to the functional activities of the Kidney, the Spleen and Stomach, and the Lung, in addition to the congenital constitution, food and nutrients, and the environment. Only when these organs function properly can the Qi of the body flourish. Conversely, dysfunction of any of these organs will influence the formation of Qi and the physiological function of Qi. For example, dysfunction of the Lung will weaken respiration, leading to failure of fresh air to be inhaled and the turbid Qi of the body to be exhaled, with the resultant inadequate formation of Qi. The transformation and transportation of the Spleen and Stomach play a particular role in the formation of Qi, for man relies on the nutrients transformed and transported by the Spleen and Stomach for his life after birth. On one hand, the Spleen sends up nutrients to the Lung to be dispersed, on the other hand, it sends down nutrients to the Kidney to supplement Kidney Essence. So, hypofunctioning of the Spleen and Stomach influences all three elementary substances that produce Qi. [Click here to continue to section 4, "The Functions of Qi"].